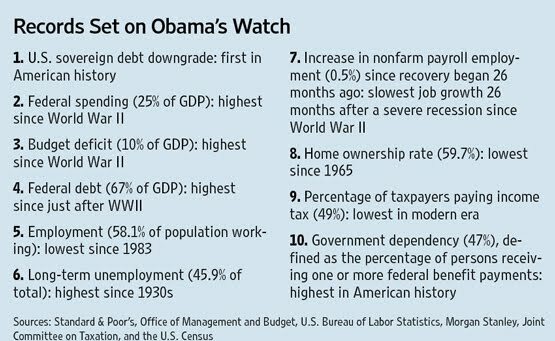 The above table (click on it to enlarge) provides all of the conventional reasons (#s 1 – 8) why BO should not be reelected & the two (#s 9 & 10) why he will be if people of substance do not double or triple their efforts to unseat him between now & November 2012. Numbers 2, 3, & 4 from the table cut both ways. For several reasons BO's long awaited speech on jobs & improving the economy that was aired pre-prime time on TV to a joint session of Congress last Thursday night offered no help to the 25 million people who are either unemployed, underemployed, or discouraged & have stopped looking for work – the speech unveiled BO's plan he called the American Jobs Act that he intends to send to Congress. First, BO's repeated calls to Congress during the speech to "pass this jobs bill" ignored the fact that no bill exists. No legislation. No amendment to existing law. No package. Nothing on paper – just a White House "fact sheet" which puts the price tag of the President's proposals at $447 billion. Source Congressman Frelinghuysen. Second, the last part of the speech shreds the Constitution that BO swore to uphold in the oath he took (twice). Excerpts from the speech – "a belief that we're all connected & that there are some things we can only do together...a nation with responsibilities to ourselves and with responsibilities to one another...just because it violated some rigid idea about what government could or could not do...that's not who we are. That's not the story of America..." The country was founded on the principles of limited government, self responsibility, & free market capitalism – not the stuff from the foregoing excerpts that only lead to both government control & dependence which of course is BO's plan & he is executing his plan this time by pretending he is all about creating jobs. Any jobs that will be created as a result of BO's plan will disappear shortly after the next presidential election. Third, BO said during the speech – "Yes, we are rugged individualists. Yes, we are strong and self-reliant." Just ask yourself how rugged, strong, & self-reliant the 47% of Americans are who collect government welfare? – see point #10 in above table. How much higher will this percentage be in the next 14 months? This can be reversed but it will take a change of mindset & a return to the original self-reliant incentive of our founding. Fourth, BO said "Some of you sincerely believe that the only solution to our economic challenge is to simply cut most government spending and eliminate most government regulations." Too bad he is not one of them. During the speech I looked @ BO & the Members of Congress he was addressing – I saw people with no practical experience for the most part, many aged people who should have retired decades ago, & some obese people who could barely move. Are you waiting for these people to solve your problems or would you rather do it yourself? I thought of the conceit & arrogance that these people have to think that they are the answers to our prayers – what we need is for them to get the hell out of the way. The central concern of this blog has always been about answering the question - how much room, if any, do individual rights leave for the state? The answer of course is found in the Constitution that is ignored more & more every day despite some of us trying to hold off the last stage of Death Of Democracy. Doug – thanks for specifying very overlooked aspect of BO Job Plan: most of BO Jobs will disappear in year or 2. Furthermore it will enlarge our debt and risk economic disaster due to increased reliance on China and Saudi Arabia financing our debt. The private economy creates most long term jobs which in turn create additional new jobs, companies, and industries. Why? because these jobs meet the supply and demand criteria - they are real and supported by the populace. And yes – we who champion capitalism must work harder in advocating our positions of economic prosperity principles. Too many Americans have become ‘soft’ and dependent on welfare and entitlements. This complacency or ‘laziness’ may be a factor also in the development of a serious obesity epidemic which significantly has increased US health care costs. I believe we can still regain that mindset of empowerment and that entrepreneurial spirit that created the greatest economic power ever. Those of us who believe in American exceptionalism will not rest until we regain and expand it to new heights. I was afraid this might happen. New poll by AP shows Americans plenty angry at Congress – Republicans will suffer including Boehner and Tea Party. Many people are willing to accept higher taxes to help bring down deficit. But they do not want government messing with Social Security or Medicare like Ryan proposes on Medicare. People want compromise between the parties. People blame Republicans for not doing it. One good thing – Republicans have a year to improve their ratings with the people. Doug - I found your “An Analysis Of BO's Speech” very insightful and of course educational. I also believe nepotism has deteriorated the quality of congressional leadership. Nepotism advances the inferior. You have to give BO credit - he is going "all out” for his program and will travel to various states to push it telling people to call their congressmen to support his program. Remember when you give people freebies they will do your bidding. The #1 issue is jobs - deficits take a big hit - people will support jobs programs and vote down limiting deficits. They will OK large deficits if they are promised jobs. That will be a big problem for Tea Party and Republicans. Tea Party came in promising to limit deficits. Times have changed since then. More and more people do not have decent jobs & layoffs are increasing. What these people decide to do will have a bearing on the election. If Republicans & Tea Partiers still want large deficit cuts at the expense of jobs – Republicans have a good chance of losing election. What are the views of your readership?